Post Adoption Support….I May Eat My Hat! It’s fourteen years next month since we adopted each other. It’s been an epic journey and it certainly continues to be so. During this time I have been an avid follower of all things political, media related and policy making around adoption. I’ve watched and listened, contributed and written to MP’s. All this alongside just trying my best to have some semblance of a healthy and secure existence for my daughter. I have never felt she was ‘owned’ by me just because she was in my longterm care, and yet when she needed support post adoption, the general response to our desperate need for help was that she was very much ‘mine’. This constant misunderstanding of her needs by our local authority, as well as her placing authority, struck me as horribly ironic. The state intervened in her birth family as her learning disabled mother sadly could not care for her and without having any support was severely and cruelly neglecting her needs. I can’t believe that nobody professional we met understood the ‘double whammy’ nature of this, and how a person full of rage due to displacement followed by further neglect of their needs was ever going to heal and thrive without great support, let alone the neglect being by those who purport to, and are paid to care. Of course I did what most adopters do and tooled myself up, trained by Dan Hughes, read Caroline Archer and the like, applied to get help from charities such as Family Futures and Adoption UK. We even latterly attended a pitiful and run down CAMHS. We got nothing really solid, regular enough or meaningful enough and I essentially became an amateur psychologist as well as a teacher and a mum. All very well, but at what cost to my daughter? I can honestly say that the most stress caused to us was by the constant ignoring or misinterpretation of my begging for help. It felt like cruelty to us both. I’m sure we may have been the ‘complex’ case we were described as, but I knew what we needed and I know it wasn’t too much to ask. The rubbish assessment processes, mismanaged meetings, unaware social workers and budget conscious managers took up all the funding we might have had. My original assessment as a suitable adopter was clear in its positive reporting that as a previously qualified social worker, I would be able to successfully identify a child’s needs and ask for appropriate support. That would seem laughable now if it wasn’t so sad. So back to today. I feel as an adoptive parent I should be celebrating the Governments announcement for funding to support adoptive families. After all I am so galvanised by our experiences that I have formed a charity to try and help others with free post adoption support. (There is no catch, we will listen and we will believe and we will understand) The funding will come from myself and other volunteers fund raising, no big charity boss salaries. My daughter is now an adult and living with support in her own home. I could go back to work to pay off the huge debts I incurred as a single parent unable to work, I could finally do my MA that I was due to start fourteen years ago, I could quite frankly laze about for at least a year to recharge my very worn out batteries, but I can’t because I feel so passionate. I feel very strongly that maybe our small contribution might mean a small amount of traumatised children might not be ignored and unsupported to the point that they are unable to remain safely in their second family. Maybe some adoptive parents might feel they got a meaningful and empathic support response that didn’t have a price tag. Maybe our creative, user led, non profit approach might be considered good practice by those who hold the power and we won’t be seen as “just mothers” playing at the big boys game. We can but try. Sadly my experience tells me that the Governments recent announcement is not very ‘charitable’ and may amount to a political sticking plaster on a gaping wound. There are hundreds of children and parents out there now who need urgent support. They can’t wait for years to see if pilot schemes work for the lucky ones. £20 million may seem a lot, but its nothing when specialist therapeutic professionals can charge up to £1000 for a days staff training, £3000 for a detailed assessment, £100-£300 per hour for therapy, and a specialist therapeutic programme costs approx £30,000 per family per year if your child is developmentally traumatised. Some of our children have sadly become big money clients in all this. (As an aside, a news item I saw this week whilst thinking of creative solutions to care was applauding the creative skills of the British and how we export our creativity successfully. This was in the context that the development of the new Grand Theft Auto game was done in Scotland. The cost of that creative development for a game which encourages crime and violence was £175 million). If we like it or not, fostering and adoption make money, wether its saving money in the case of adoption over fostering, or simply in private agencies gaining fees to fund their jobs in the care ‘industry’. 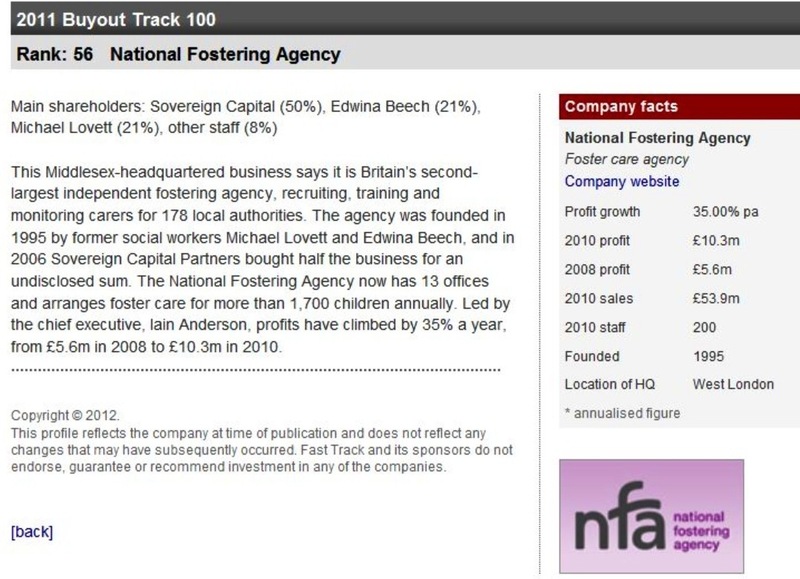 The National Fostering Agency was sold last year for approx £130 million. Private adoption agencies make money and the average fee gained for placing a child with an adoptive family is £27,000. Support agencies make profit. 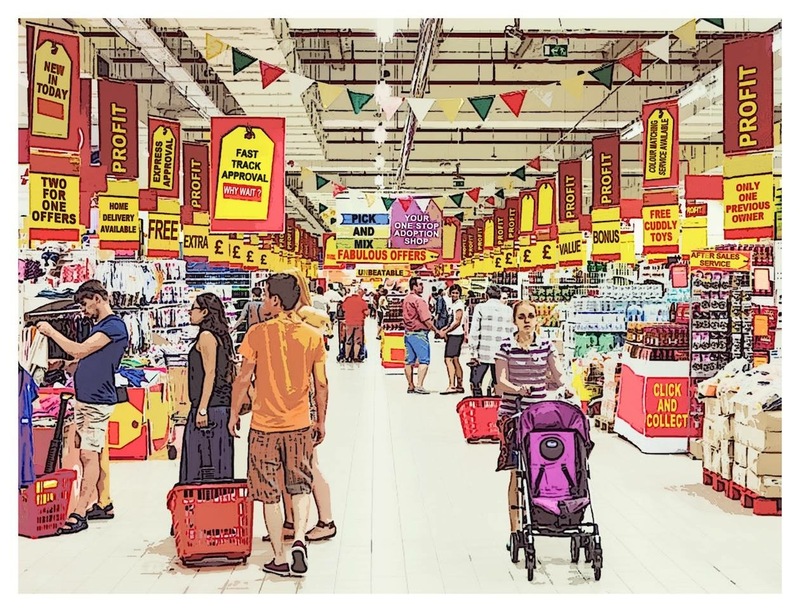 It’s reportedly been tough for the smaller agencies to survive with prospective adopters low in numbers, hence the Governments recent financial assistance to help them make more “sales”. I know being professional and skilled deserves and needs payment, but not the expense of those one is in the business of supposedly helping. Apologies for my cynicism and if I am proved wrong by amazing, enshrined in law, support to all adoptees and their families (including kin) in the near future……meaningful and quick assessments of need, free therapy, quality identity and life story work, empathic fair access to education, specialist training and respite for parents and support to adoptees post eighteen……..I’ll eat my (very fashionable) hat.